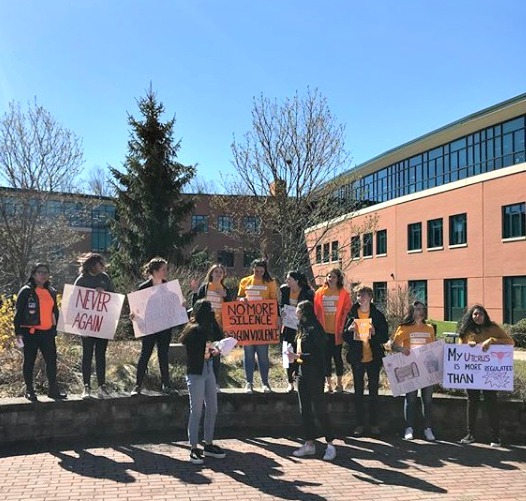 It was a day of activism, for hundreds of Staples High School students. From 10 a.m. until the end of school, the courtyard was packed. Speeches, poetry, music and more drew attention to the very real issue of gun violence. One girl said she was told there were consequences for leaving class. “I can’t get a detention if I’m dead!” she replied. 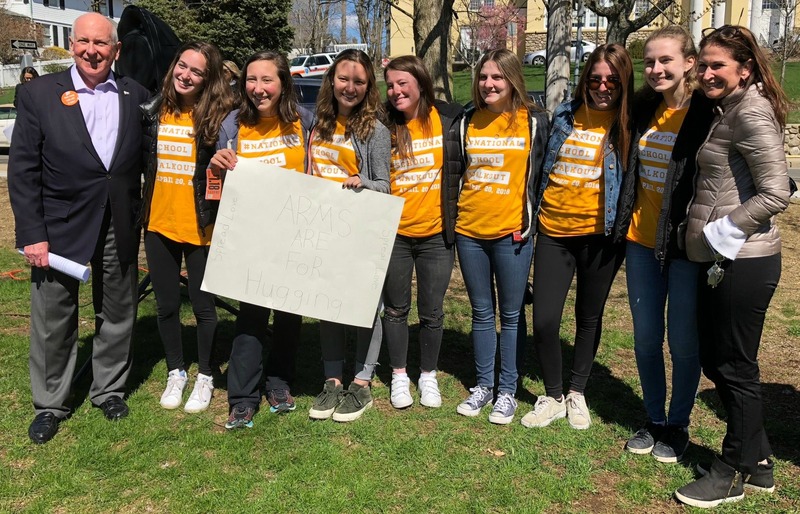 At 3 p.m., a smaller group of students — bolstered by other Westporters, of all ages — gathered on Veterans Green across from Town Hall. Politicians of both parties were in attendance. 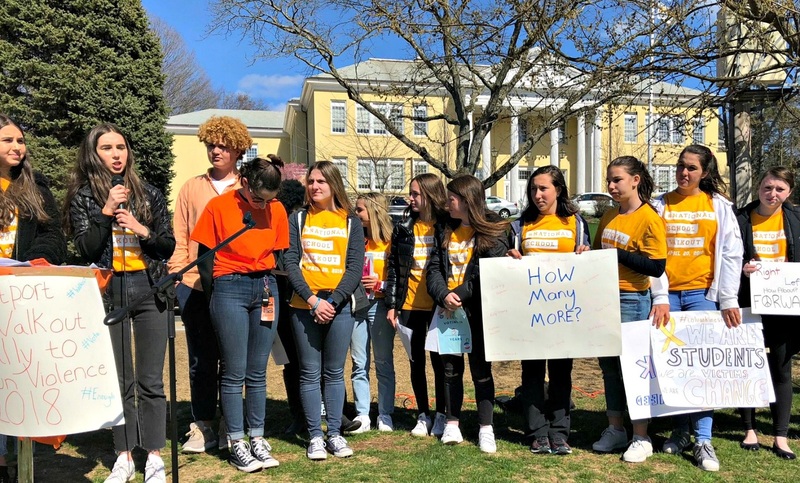 But the students — noting the non-partisan importance of legislation — took charge. After all, it’s their future. 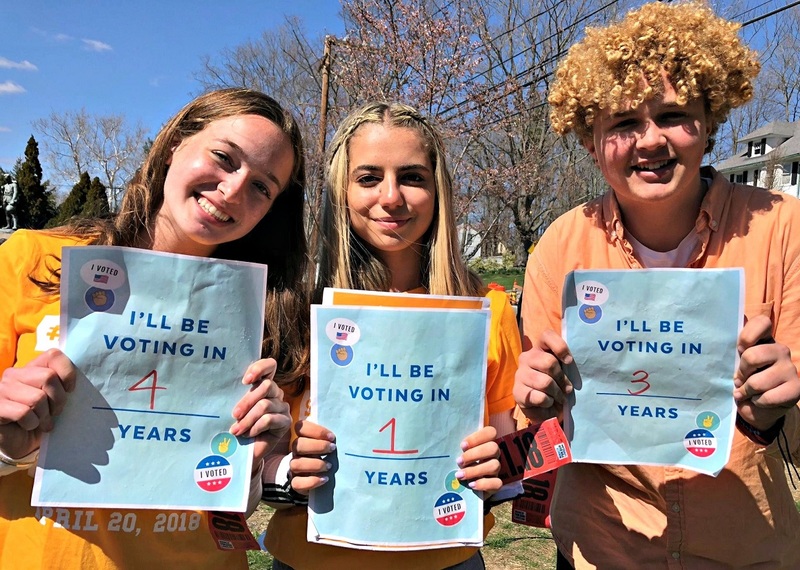 Staples students look ahead to turning 18 — and turning out to vote. First Selectman Jim Marpe (far left) and 3rd Selectman Melissa Kane flank Staples students. 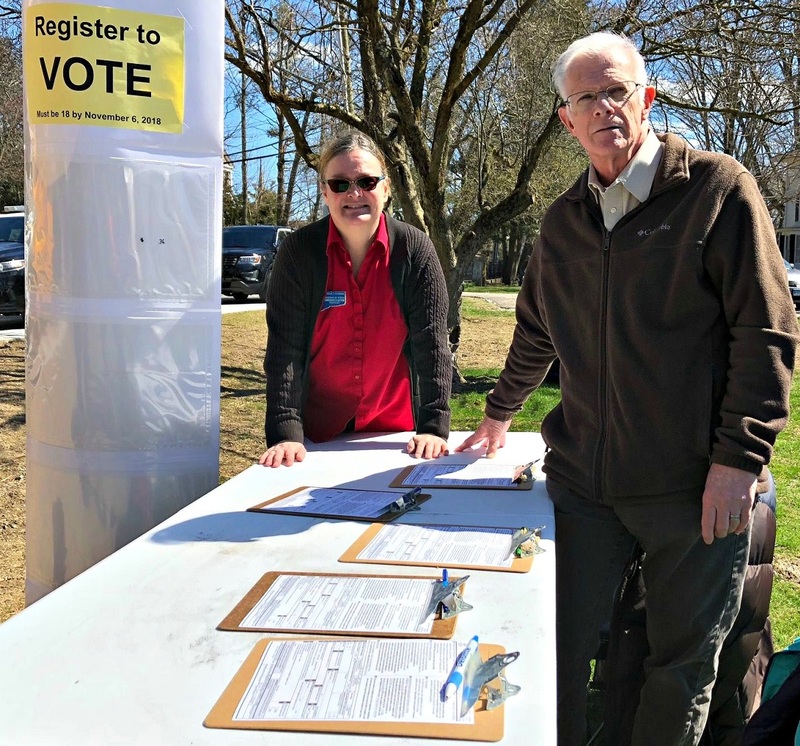 Registrars of both parties were on hand to enroll new voters. 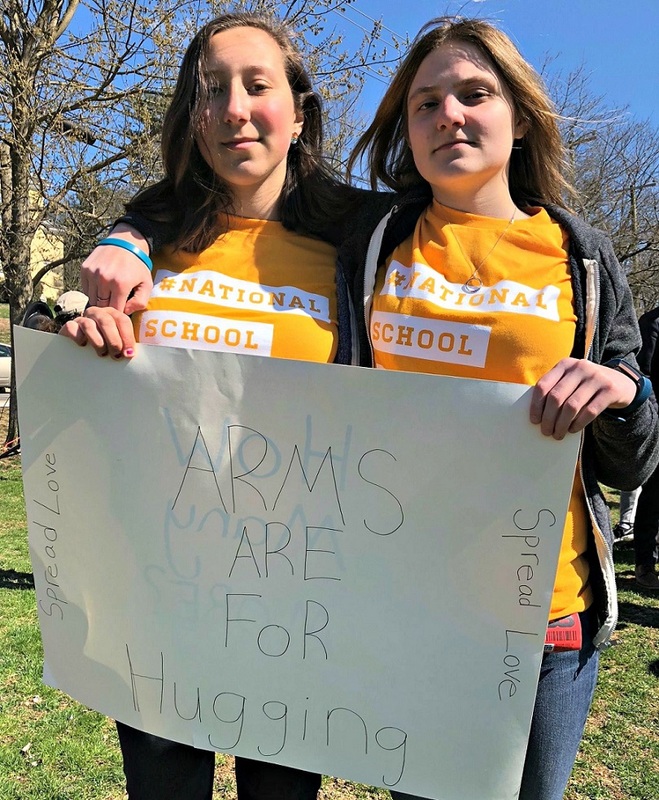 “Arms are for hugging,” says the sign. 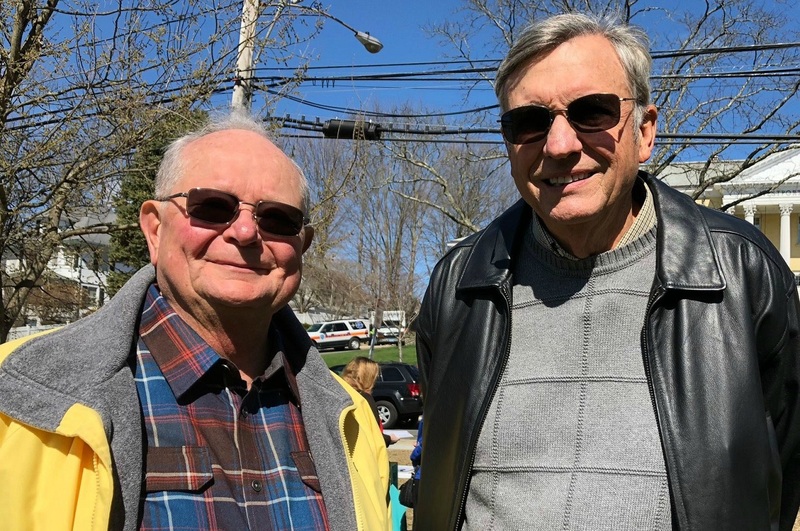 Former Staples High School assistant principal Lee Littrell (left) and chemistry teacher Bruce McFadden came to Westport to support the activism of current students. 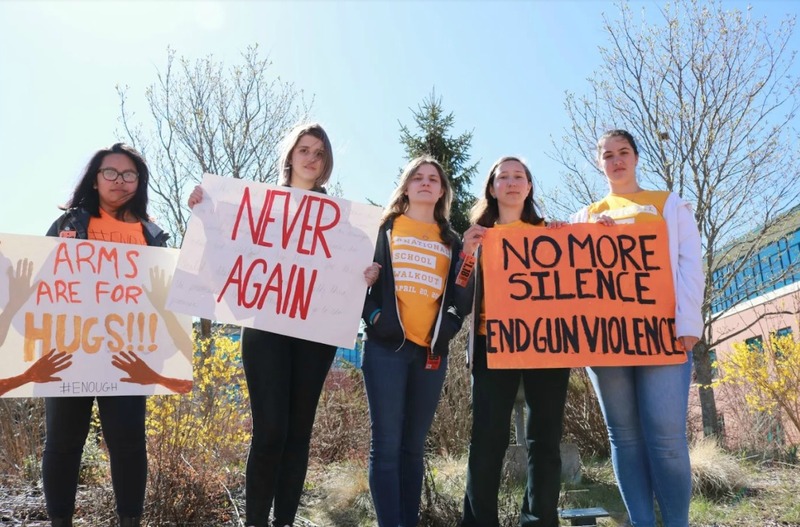 This entry was posted in People, Politics, Staples HS, Teenagers and tagged April 20 walkout, Gun legislation, Staples High School student activism. Bookmark the permalink. The future is in good hands. We were proud to be there. I could not agree with you more!!! Proud of our young people! Love their passion & commitment to doing good & what’s right! These young adults are an inspiration and give me hope that change in the form of gun control may just be on its way. Thanks to each and every student from Staples for showing up and showing us what it looks like to be a good citizen. And thanks also to Will Haskell for an inspiring message to and for all of us. So proud of those kids. It gives me hope. And Will Haskell was impressive! Super coverage, Dan! These kids are so strong and determined to change our world for the better. I applaud and support them,. punished for trying to protect thier peers?? Here comes the next YouthQuake ! They will change the world, and none too soon! Maybe they can convince Black Lives Matter to take the battle into impoverished minority neighborhoods after they’re finished with white cops.